Everybody knows this iconic cartoon. 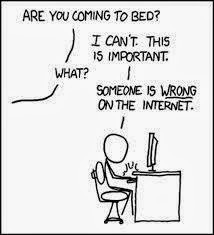 Worse, everyone who has spent any time in various online forums has fallen prey to the sentiment. After many years (and the help of an 11.25-step program) I have mostly given up the addiction of trying to correct all the idiots on the web (or listening to their attempts to correct me). But sometimes you run across something so monumentally stupid that you just have to do something, even if it is only holding it up for ridicule on an obscure blog floating forlornly on the vast ocean of the internet. You may have heard that the Oklahoma State legislature has gotten itself into quite a pickle. The legislature decided it wanted to have a Ten Commandments monument erected on the grounds of the state capitol. Anyone but an idiot knows the purpose was to proclaim the hegemony of local fundamentalist Christian majority, in clear violation of the Establishment clause of the Bill of Rights. But, as a [cough] fig leaf, State Rep. Mike Ritze, R-Broken Arrow, who introduced the bill and paid the $10,000 cost of the monument, and state Sen. Randy Brogdon of Owasso, the bill's Senate sponsor, argued that the monument would only honor the historical significance of the Ten Commandments and not its religious aspects. They readily admitted that they were basing this on the Supreme Court decision in Van Orden v. Perry. The Van Orden case had significant factual differences from this situation. Both the plurality decision by Justice Rehnquist and the concurring decision by Justice Breyer (who was the fifth vote to uphold the constitutionality of the Texas monument) made much of the fact that the monument was donated by an outside and widely respected civic group, the monument had stood for some 40 years without complaint and it was one of 17 monuments and 21 historical markers commemorating the "people, ideals, and events that compose Texan identity." [Van Orden] also differs from McCreary County, where the short (and stormy) history of the courthouse Commandments' displays demonstrates the substantially religious objectives of those who mounted them, and the effect of this readily apparent objective upon those who view them. That history there indicates a governmental effort substantially to promote religion, not simply an effort primarily to reflect, historically, the secular impact of a religiously inspired document. And, in today's world, in a Nation of so many different religious and comparable nonreligious fundamental beliefs, a more contemporary state effort to focus attention upon a religious text is certainly likely to prove divisive in a way that this longstanding, pre-existing monument has not. Correctly focusing on the Oklahoma monument's stand-alone nature, a number of organizations have been lining up for a chance to have their own monuments erected. First and most amusing was a Satanist organization, whose design is, I think, rather nice. And it is people friendly too! The Satanic temple spokesman, Lucien Greaves, said in a statement. 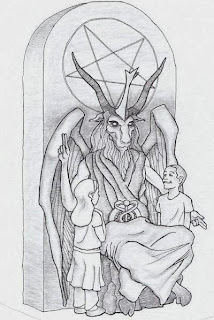 "The statue will also have a functional purpose as a chair where people of all ages may sit on the lap of Satan for inspiration and contemplation." Trait Thompson, chairman of the Capitol Preservation Commission, which decides on monuments on the capitol grounds, said that "There are standards for this type of art. It has to be relatable to the history of the state of Oklahoma in some form or fashion. And it has to be museum-quality art." Whoa! Let's look at the 10 Commandments monument, shall we? The only museum that would belong in is one that celebrates tombstones. Of course, the Oklahoma legislators are busy digging the hole they're in even deeper. "I think you've got to remember where you are. This is Oklahoma, the middle of the heartland," said Rep. Don Armes, R-Faxon. "I think we need to be tolerant of people who think different than us, but this is Oklahoma, and that's not going to fly here." Umm ... the purpose of the Establishment clause is not for the government to be tolerant of non-majority religious or non-religious beliefs but to be neutral towards all of them. "I do not see Satanism as a religion, and they have no place at the state Capitol," said [Rep. Earl] Sears, R-Bartlesville. The government doesn't get to decide which religions are "real" and which aren't and why is religion even an issue if you are just celebrating the historical influence of the 10 Commandments? Surely you are not going to deny the historical influence of the concept of Satan, after so many Christian leaders have sermonized about him throughout our history, are you Representative? Even worse for the legislature, now a Hindu group has proposed erecting a statue of the monkey god, Lord Hanuman. Even if they could make some case that the Satanist's offer is a sham, there is no way they could deny a religion such as Hinduism, which has a small but real presence in Oklahoma, access to government grounds on the same basis as Christianity. As a result, the state has called a moratorium on all proposals for monuments on the capitol grounds pending the outcome of an ACLU lawsuit, further admitting that the original intent was to further Christianity. But enough preliminaries ... let's get to the stupid! One Delilah Belmont, self-described as a "professional journalist and blogger," for something called the Civic Tribune, has an article under the headline: "Hindus Attempt To Violate First Amendment, Propose "Giant Monkey God" Statue On Oklahoma Capitol Grounds." Now, if a Hindu group was trying to have a monument only to its religion on government grounds, that would be, if successful, a violation of the Establishment Clause and all we could accuse Ms. Belmont of was being incredibly ignorant of the story she was purportedly reporting on. But that's not it! Yesterday marked the day that yet another religious minority group demanded special treatment from the United States. A Hindu sect called the Universal Society of Hinduism made a request to the Oklahoma State Capitol Preservation Commission asking to have a monument of their own placed on Capital grounds, a giant statue of their demonic Monkey God named "Lord Hanuman." This request is a timely one, and adds to the growing list of religious minorities in the United States who are seeking to be treated above and beyond the average American, such as last week's attempt by Satanists to get their own memorial added to the same grounds in Oklahoma's Capital. Despite the First Amendment protecting government property from endorsing or sponsoring religious freedoms that were not Christian, the Satanic religious group has won their plea to have a monument erected on capital grounds. This has opened the flood gate for even more religious minorities to request their own pagan Gods be represented on federal soil, as we have seen yesterday with the Hindu group's application. 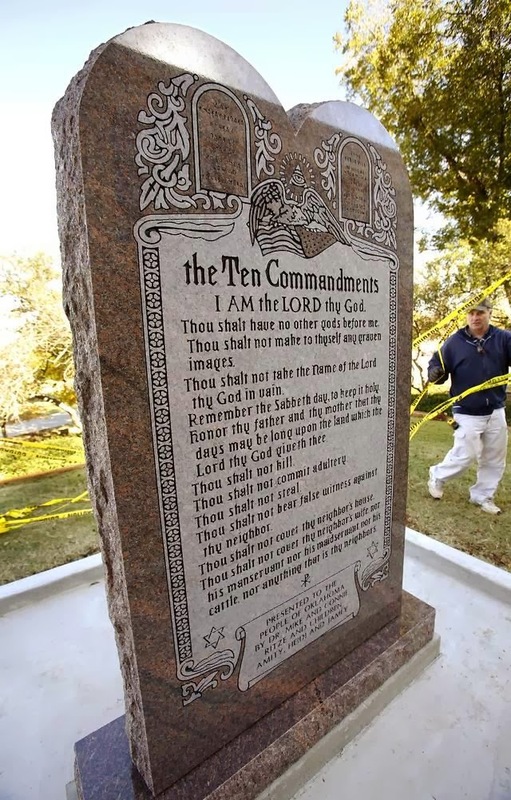 The Satanic monument will join the 10 Commandments monument that was built in 2012, after the GOP state legislature passed a law that allowed religious displays back in 2009. This law was of course only meant to allow Christian religions access to placing their own monuments on the property, but due to an unforeseen loop hole, Satanic and Hindu groups are now taking advantage of the legislature. Lordy, lordy, lordy! Where to begin? Of course, she got the factual details wrong. The Satanic monument has not been approved. Nor does this case involve "Federal soil." And Hindus do not consider Lord Hanuman to be "demonic" (quite the contrary, he is considered the embodiment of bravery and faithfulness), anymore than Christians consider their God to be demonic ... although others may have a different opinion on that score! But, worse, she seems completely ignorant of the US Constitution! Even the clinically insane (or cynically deceptive) Bryan Fischer merely claims that the Establishment clause protects Christianity only, not that it prohibits government endorsement of religious freedoms for non-Christians. Nor is it seeking "special rights" or to "be treated above and beyond the average American" to demand that the government treat all religions equally. And, it wasn't a "loop hole" in the law that is going to trip up the Oklahoma legislators. It is, in fact, the Establishment Clause that will bring this whole scheme to grief. The one thing that Ms. Belmont got right was that "[t]his law was of course only meant to allow Christian religions access to placing their own monuments on the property." What she fails to appreciate is that the legislators, in doing so, not only broke the 9th Commandment (as Protestants count them) but their oaths of office to "protect and defend" the Constitution of the United States. The only "loophole" here is that the people of Oklahoma elected a particularly dumb and venal breed of legislators. Not to mention breaking the 1st (or 2nd) commandment against carved images, etc. And being damned anti-American too. Click on the picture of the monument. It has the American flag upside down! We need to be thankful for Ms. Belmont - people with her kind of open honesty help us establish intent. Maybe somebody should (a la Flying Spaghetti Monster) form a religion based on the worship of large blocks of stone, and claim "10 commandments" as one of their idols, along with Stonehenge, etc. They could perform ritual dances around their idols on certain occasions, burning incense, incantations. "the Oklahoma legislators are busy digging the hole they're in even deeper." Hardly worth the effort. Just compare "special treatment" with "This law was of course only meant" and everyone with an IQ higher than room temperature will recognize the double standard. End of debate. Every religion has its spiritual bad actors, I suppose, but isn't Satan specifically a Judeo-Christian construct? In other words, isn't Satanism just another Christian denomination, along with the Methodists, Roman Catholics, Lutherans, Baptists, etc., although one with a significantly different interpretation of events? So, even if Ms. Belmont's ridiculous assertion were correct, the Satanist monument would still be allowable as a Christian thing. Too bad about the monkey, though. Too bad about the monkey, though. Cette sneaker blazer low nike était importante pour cette sneaker classique moderne car sa technologie Air-Unit et sa partie cortez nike 2017 arrière transparente étaient révolutionnaires. Loup Gris / Noir / Volt, Blanc / asics bleu et jaune fluo Noir, Noir / Blanc / Varsity Rouge et Noir / nike air huarache femme spartoo Gris foncé / Noir sont tous proposés à l'achat dès maintenant. basket homme nike air max command leather noire De même, les adultes à la mode trouveront une paire qui leur convient.